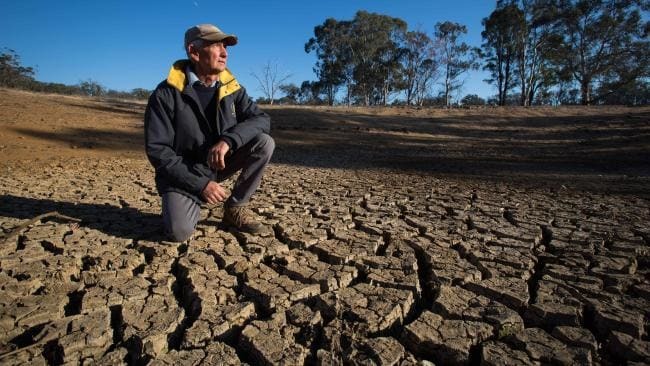 The eastern half of Australia is in the grip of severe drought. New South Wales is 100% in drought, with 20% of the state in severe drought. In July less than 10 mm of rain fell in the West, North West and Central regions. The drought is claimed to be worse than the drought of 1902. Queensland is entering its seventh year of drought with 60% of the state in drought. In Victoria the Mallee and East Gippsland are also suffering from drought, with some areas receiving the lowest rainfall on record. Dry conditions in South Australia and Western Australia are also causing concern. Livestock farmers are paying record prices for hay to feed their livestock. Many are selling all their stock in order to survive. Crop farmers face the prospect of a year with no income as crops fail. Soil erosion is becoming a problem in some areas because of the extremely dry conditions. Since 1950, most of southern Australia has experienced substantial rainfall declines with below average falls across the south-west since 1970, and south-eastern Australia since 1997. From the 1970s, late autumn and early winter rainfall has decreased by 15% in south-east Australia, and Western Australia’s south-west region has experienced a 15% decline in cool season rainfall. This year’s rainfall over southern Australia is the second lowest on record. We are seeing an increase in the intensity and frequency of hot days and heatwaves in Australia, exacerbating drought conditions. On the other hand we are also seeing increasing intensity in tropical cyclones and damaging heavy rainfall events in northern Australia. Farmers need to reject the climate change deniers in the ranks of the Liberal and National Parties, as well as those in their own farmer organisations. They need to get behind groups such as Farmers For Climate Action (www.farmersforclimateaction.org.au). This group is calling for immediate action on climate change. They seek to introduce climate-smart farming practices and more research and development to allow farmers to adapt to changing climatic conditions. The group advocates moving Australia’s energy system away from fossil fuels and towards renewable energy. They are active in the “Stop Adani Alliance.” They have been campaigning against the Queensland Government’s proposed grant of an unlimited free 60 year water licence to Adani. They are also campaigning against the Government’s compulsory acquisition of farmland for Adani’s railway. Other groups such as “Lock the Gate” are active against coal seam gas mining and fracking. They too need all the support that farmers and all Australians who care for the environment can give them. (1) G Horton et al, “Drought, drying and climate change: Emerging health issues for ageing Australians in rural areas. “ Australian Journal of Ageing, Vol 29, No 1, March 2010. (2) M. Freund et al , “Recent Australian Droughts May Be The Worst in 800 years.” The Conversation, 2 May, 2018.